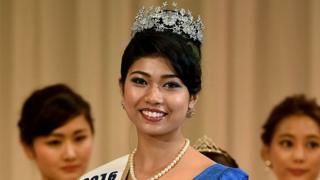 A half-Indian woman has been crowned Miss World Japan, the second year in a row a biracial person has won a beauty pageant in the country. Priyanka Yoshikawa, 22 and who also has an elephant training licence, said she would use her win to "change perceptions". Last year, Ariana Miyamoto was the first mixed-race person to win the Miss Universe pageant. Critics complained then that a "pure" Japanese should have won. Only about 3% of babies born every year in Japan are biracial, or "hafu", the Japanese word for half. "We are Japanese," Ms Yoshikawa told AFP news agency. "Yes, my dad is Indian and I'm proud of it, I'm proud that I have Indian in me. But that doesn't mean I'm not Japanese." She credited her win to Ms Miyamoto, saying she had helped show "mixed girls the way". "Before Ariana, hafu girls couldn't represent Japan," said Ms Yoshikawa. "That's what I thought too. Ariana encouraged me a lot by showing me and all mixed girls the way. "I know a lot of people who are hafu and suffer," she said. "When I came back to Japan, everyone thought I was a germ." "Like if they touched me they would be touching something bad. But I'm thankful because that made me really strong." A few years ago, a woman of Indian descent, Nina Davuluri, faced Twitter abuse after being crowned Miss America. Some called her an "Arab", some a "terrorist", and some an "Arab terrorist". Indians, in large numbers, came to her defence. Now, Ms Yoshikawa is being criticised for having an Indian father and some Indians have taken to social media to advise the Japanese to "get over it". One Twitter user said she won because she "must have deserved it" while another said "after Gautam Buddha, Ms Yoshikawa is the only Indian to make it big in Japan". In Ms Yoshikawa's case - as in Ms Davuluri's before her - the biggest complaint seems to be the "lack of purity". But some are wondering whether this debate over purity has any relevance in today's globalised world. As one Twitter user said: "Talent cannot be controlled or ruled by caste, colour, gender or country of origin." The pageant winner, also an avid kick-boxer and qualified elephant trainer, said that she hoped to change perceptions. "When I'm abroad, people never ask me what mix I am. As Miss Japan, hopefully I can help change perceptions so that it can be the same here too." Ms Yoshikawa's win did not trigger the backlash that Ms Miyamoto received on social media. There were however, several on Twitter that expressed unhappiness. "It's like we're saying a pure Japanese face can't be a winner," said one user. "What's the point of holding a pageant like this now? Zero national characteristics," another complained. Ms Yoshikawa however, was not letting the doubters get to her.